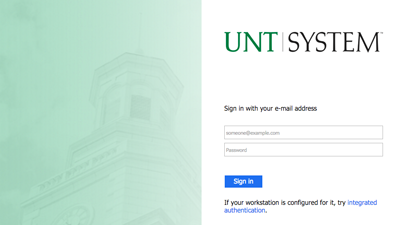 If you are unable to log into EagleConnect, the issue may be related to the new login page. Please try the following steps to log in. Ensure that you are signing in with your full email address. Students, you can find your EagleConnect address by logging into the Account Management System, AMS. It will be listed in the "Student E-Mail" field. Employees, please contact your department's Distributed IT Support Group if you do not know this address. Remember, your password is the same as the one used for all UNT systems. Please visit the Account Management System (AMS) to reset your password. Be sure that you are not using a bookmarked page or a link saved in your history - go directly to EagleConnect. Ensure that your browser is updated to the latest version. Click here to verify your browser. (V. 8.0+) Go to Safari (on the menu bar) > Clear History and Website Data > Select "All History" > Click "Clear History"
Note: Close and re-open the browser after clearing the browser's cache and cookies. Mac Users: If on Mac OS X, a full quit (Command+Q) and re-opening of the computer are required.